Save the date - the PSS will be staffing the fluid station during the NYC Marathon on Sunday, November 2, 2014. In the summer of 2014, Anna Frajlich-Zajac for the first time returned to Kyrgyzstan, the country of her birth, at the invitation of former president Roza Otunbayeva. During the war, Frajlich's mother, separated from her mobilized husband, was evacuated from Lvov to Kyrgyzstan, where she gave birth to Anna near the city of Osh, on the Roof of the World. Frajlich will share the story of her return to the unknown, the curious chain of events of how it came about, and the incredible homecoming that was organized in her honor. Once again we are forming a team of Polish Students to run the President Bollinger’s Fun 5k Run on Friday morning 10/24. The registration for CU ID holders is free and includes a commemorative t-shirt. If you can’t register, for whatever reason, please come to cheer and join us for lunch afterwords. Runners, please register soon, the registration usually closes within a first few days and wear Polish gear, national jersey or simply red t-shirt. The run is on Friday 10/24 at 8am, starting from the Sundial at the center on the main college walk, the course will take us to the Riverside Park and back. More info is on our Facebook event page. The films feature the four winners of the First New York State Poetry Unites contest, which was inspired by Robert Pinsky's Favorite Poem project and was a collaboration between the Academy of American Poets, Polish filmmaker Ewa Zadrzynska, New York State Poet Laureate Marie Howe, philanthropist Corinne Evens, Donald Faulkner from the Writers Institute in Albany and the New York State Office of Cultural Education. "How to avoid (what is?) the middle income trap? The role of social capital - the case study of Poland." The event will take part next Wednesday (15.10) at the Polish Mission to the UN from 8:30-9:45. The event will be opened by Mr Paweł Radomski, Deputy Permanent Representative, followed by a short presentation by Kamil Pruchnik, the president of the YRP and discussion among UN delegates and participants. Soft drinks will be provided – please feel free to bring your own breakfast to the event. Where: Max SoHa, 120th Street and Amsterdam Avenue. ﻿Anna Frajlich, Polish poet and professor of Polish language and literature at Columbia University, will introduce her new book, A Boat and a Harbor It Is ["Łodzią jest i jest przystanią"], at the Consulate General of the Republic of Poland on October 8, 2014. The event will be moderated by Izabela Barry of the Brooklyn Public Library Branch Greenpoint. This is a Polish language event. The Polish Student Society at Columbia University and Barnard College will be marching in the Pulaski Parade on Sunday, October 5, 2014. We will meet at 10:30 AM by the Polish Consulate on the corner of 32nd Street and Fifth Avenue. This year we will be again trying to stand out from the white-and-red crowd by wearing Columbia Blue and Columbia collegiate wear. We will also carry a new club banner and march with the Kosciuszko Foundation. A reception at the Kosciuszko Foundation will follow. 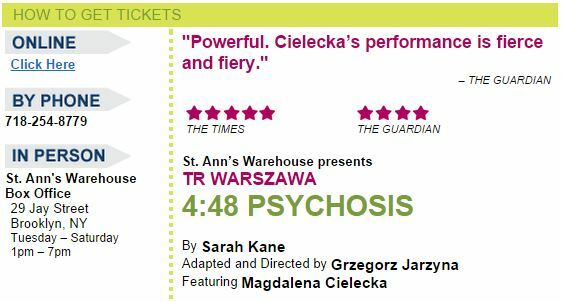 Sarah Kane’s extraordinary final work, 4:48 Psychosis, is a lacerating and lyrical depiction of a mind on the edge. Anchored by the stunning vision of director Grzegorz Jarzyna, Polish company TR Warszawa’s acclaimed production ricochets between passionate extremes. Poland’s revered Magdalena Cielecka swings wildly from elation to despair, sculpting a convincing, lucid argument for non-existence. Conditions: *Prices subject to change. Some of New York’s OUTstanDing poets read on the Upper West Side on Monday evening, 9/22, at PicNic Market & Cafe, 2665 Broadway (west side of the street) between 101st and 102nd streets; reading starts 7:30 pm; dinner served from 7 pm (for reservations, see below) including special POETS PRIX FIXE dinner: $25. No Cover. PEOPLE PLANNING TO DINE are asked to make reservations and arrive by 7. Reservations can be made by calling PicNic at 212-222-8222 or going to www.picnicmarket.com. Getting there by subway: Take the 2 or 3 to 96th and walk UP, or the 1 to 103rd and walk DOWN. After our very successful last meeting in Klimat downtown, we are going to meet again in Amigos. This time in our neck of the woods on Broadway between 112th and 113th Street. It’s this Tuesday 9/16 at 8pm. We have a few new faces, that have recently came from Poland so please come and say hello! Tuesday night at Amigos there is an unlimited Quesadillas and Margaritas for $19.95!!! What?! If you are wondering which class to add or drop, you can think about taking classes with one of our Polish lecturers. In the attached image you will find list of lecturers with corresponding subjects, points, dates and information whether they are now open or full. Meet the Author: Magdalena Rittenhouse Friday, September 12, 2014, at 7:00pm Author and journalist Magdalena Rittenhouse will be at the Kosciuszko Foundation on Friday, September 12th, at 7 p.m. to talk about her book, Nowy Jork: od Mannahatty do Ground Zero. Discussion hosted by Zuzanna Ducka-Lubas of Nowy Dziennik Polish Daily News. This event will be in Polish. It's time to get to know each other. Polish Club at Columbia University invites you for the 1st Polish Students Integration Party. Bring friends and join us - all are welcome! THIS EVENT IS ORGANIZED BY POLISH CLUB AT COLUMBIA UNIVERSITY AND IN PARTNERSHIP WITH POLISH STUDENT ORGANIZATION AND POLISH FILMMAKERS OF NYC.